Let’s get started with my countdown of the top 5 commercials from Super Bowl LII. Leslie Jones was in this commercial, need I say more? However, Jones — a cast member of Saturday Night Live — wasn’t the only celebrity involved in this commercial. Involved with Jones are actress Rebel Wilson, chef Gordon Ramsey, rapper Cardi B, actor Anthony Hopkins and comedian JB Smoove. There were actually two separate commercials, with Jones and JB Smoove starring in a second commercial. However, both were so good and had me howling the whole time. Also, Amazon has people talking about a certain city. With the Amazon HQ2 “competition” making headlines, in the first commercial, Alexa loses her voice telling a woman about the weather in Austin, Texas. Did Amazon secretly hint the location of their new second headquarters? Only time will tell! Tide had five — count ’em, five — advertisements in the Super Bowl this year. David Harbour, of Netflix‘s Stranger Things, was in all five commercials, but this one was the best. The ad seemingly made fun of other ads, by pretending that a segment would be a car advertisement or another product. Other advertisements from Tide fell flat for me, but this one was good. Tide definitely tripped me up with the Clydesdale horses, which are normally my favorite during the Super Bowl. The advertisement kept viewers on their toes and laughing. However, a large gasp was heard around the room I was in, when the beer bottle fell off the bar. Now, that there is a party foul. I love commercials that make you feel something. As if the Super Bowl evening wasn’t already filled with pre-game tears for This Is Us, Toyota‘s “Good Odds” commercial told the story of 36-year-old Canadian alpine skier Lauren Woolstencroft, who has eight gold medals from various different Winter Paralympic Games. Woolstencroft was born without feet, and her story showed childhood videos of tears and triumph. With the upcoming Winter Olympics and Paralympics in South Korea, the commercial had perfect timing and was incredibly heartwarming. Seeing athletes triumph over struggles like disabilities and hardships proves that it’s much more than just sport. If anyone who is American and born before 2000 says Danny DeVito isn’t one of their favorite actors, then there’s a real problem. 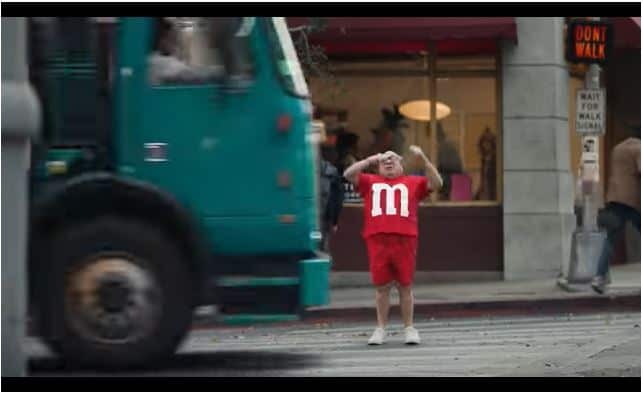 DeVito played the famous red M&M, who finds a lucky penny on the street and wishes to be a human. He is annoyed that humans are trying to eat him, after all! DeVito goes around asking people if they’ll eat him, to which they all respond no. This commercial was hilarious in the sense that DeVito playing an M&M is not your usual Super Bowl commercial. With the rise of new, younger actors, he isn’t one you’d think would be in a Super Bowl commercial. M&M’s comes out with good commercials every year. This year was no different. The New York Giants won the Super Bowl and they weren’t even in Minneapolis. Eli Manning and Odell Beckham Jr. are on the sidelines chatting and Manning says, “You want to work on that thing?” Beckham replied back with a yes, and the two begin to run drills. When Manning finds Beckham Jr. in the end zone, music from Dirty Dancing begins to play. The two begin to follow the same dance that Jennifer Grey and Patrick Swayze danced. It even goes as far as Manning lifting Beckham Jr. into the air, and being joined by fellow teammates Landon Collins, Brett Jones, John Jerry, Chad Wheeler, D.J. Fluker and John Greco for a group dance. All I’m saying is, if Dancing with the Stars needs a new cast member soon, Manning has some moves! This concludes my countdown of the best Super Bowl LII commercials. What were some of your favorites? Let me know in the comments below or find me on twitter Twitter and @ me.